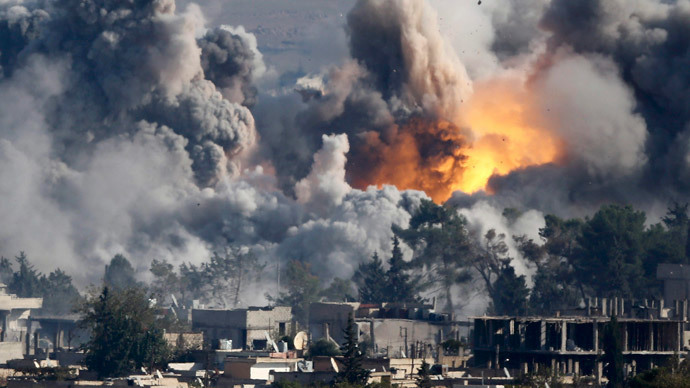 At least 50 so-called Islamic State (IS) militants were reported dead in an intense day of clashes and US-led airstrikes in the Syrian border town of Kobani, a monitoring group has said. The fighting, which took place on Saturday and early Sunday, was reportedly one of the deadliest 24-hour periods for IS militants since they launched a mid-September assault to seize the city from its predominantly Kurdish population, the British-based Syrian Observatory for Human Rights said. Eleven Kurdish fighters were also killed, according to the group. 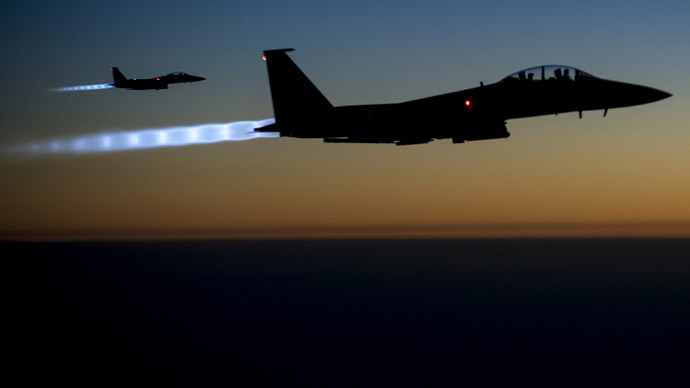 Meanwhile, the Observatory also said the coalition had launched 30 airstrikes in and around the northeastern city of Raqqa – the de facto capital of the IS in Syria. The strikes targeted both positions in the city and the sprawling Division 17 airbase, which the IS seized from the Syrian military earlier this year. No information regarding casualties has been released so far. The reports indicate a significant shift in momentum for Kurdish forces, which have been bolstered both by compatriots from Iraq and the US-led air campaign which began on September 23. 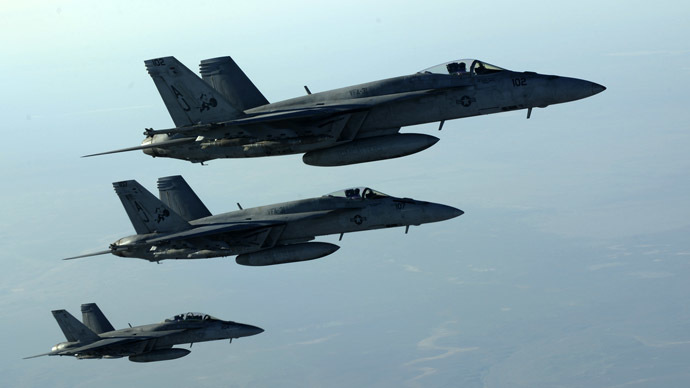 John Allen, the US coordinator of the coalition, said earlier this week that at least 600 IS fighters had been killed in airstrikes so far, AFP reports. He added that by concentrating its forces on Kobani, the militants had made themselves easy targets for coalition warplanes. Syrian Foreign Minister Walid Muallem, however, said the airstrikes would ultimately be ineffective unless Turkey closed its borders to militants. Muallem’s claims are likely to be strengthened by reports that the IS launched its first attack against Kobani from Turkish soil on Saturday. According to Nawaf Khalil, a spokesman for Syria's prominent Kurdish Democratic Union Party, IS forces advanced from Turkish territory to attack the border crossing between the embattled city and Turkey. 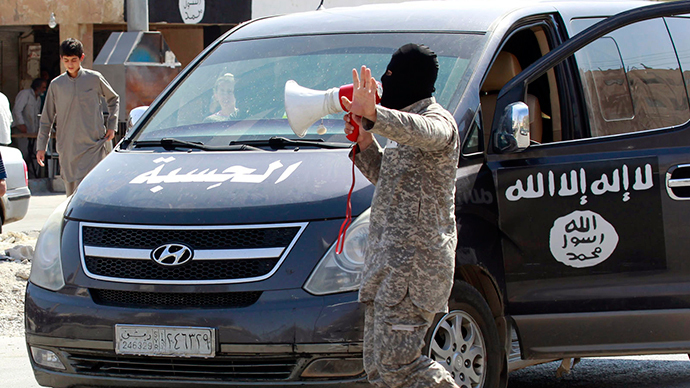 The Islamic State "used to attack the town from three sides. Today, they are attacking from four sides," AP cited Khalil as saying. 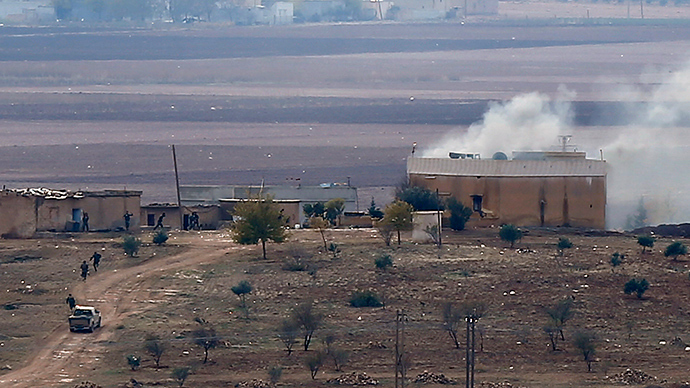 Heavy fighting, in which IS used tanks to bolster their ground forces, also took place southwest of Kobani. Ankara has yet comment on reports Turkish soil has been used as a staging ground for IS to launch attacks. Turkey has characterized the presence of IS on its borders as a “strategic risk and threat,” but has so far balked at US calls to employ military force to stem the tide of jihadist forces. Despite broad regional and international support for the Kurds fighting in Syria, Ankara has resisted any moves which could bolster its own 13.4-million-strong Kurdish population. In October, Turkish President Recep Tayyip Erdogan said that the Syrian Kurdish PYD (Democratic Union Party) in Kobani is "no different" to the Kurdistan Workers Party (PKK). The PKK is banned in Turkey as a terrorist organization for leading a 30-year struggle against Ankara in order to create a Kurdish autonomous region in southeastern Turkey. Ankara has previously demanded that US-military action against the government of embattled Syrian President Bashar Assad would be a pre-condition for increased cooperation in the fight against the IS. Damascus has accused Turkey of supporting "terrorism" due to its support for Syrian opposition fighters. Turkey has denied the allegations.